I working the various camera on gimbal. Serious problem remote camera shooting or other ordenary TTL remotely device (GPI). I would without it RC switch and any unwanted parts. I would be very grateful for it. Been there for ever, just select Sxx (S for switch) in the rx pin configuration. I'm having problems with telemetry on OpenLRSng. I have it successfully set on my Taranis with both D4R and X6R (using s-port), using FRSKY protocol (with Harakiri on a Flip32 with signal inverter or a Naze32 without) or Mavlink with a Mavlink to FRSKY converter board (a flashed Pro Mini). The converter works also with an APM. I did the mod shown in the Wiki for a 1W OrangeTx UHF. After that it would not connect to the serial port in the OpenLRSng Google chrome app ... I desoldered the transistor + 3 X 1K resistors and could connect again ... (even with out the R2 resistor ...). Then I figured that I could invert the signal between the Flight controller and the receiver (the same way I do with the FRSKY receivers) using the FRSKY protocol ... no go. I tried many settings on the Tx Module : FRSKY, FRSKY smartport, 8 ch , 12 ch ... I tried the Mavlink protocol with the converter board (no signal inversion) ... I fed 3,3v devices to the Tx and RX pins on the OrangeTX ... nothing. Does anyone have a working setup ... and perhaps can tell me what I'm doing wrong ? Chris, did you ever solve this issue? I just did the mod and ran into the same thing. BTW - You only have to disconnect the TX connection to get it to work again. 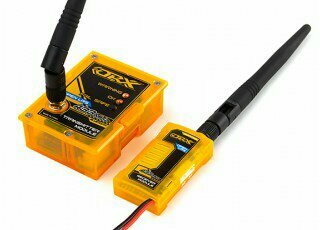 I have an OrangeRX OpenLRS module which I've been using with my Turnigy 9xr Pro. Yesterday I tried to connect to the configurator by following the instructions stating that I would have to connect a 3.3v FTDI converter while the module was inserted in the transmitter housing. I had successfully flashed to the latest firmware via the configurator using what I thought was this method but now I can't remember if I used an FTDI or a JTAG... Anyway, something happened in the process that appears to have shorted my TX!? The 9XR-Pro won't boot at all now and only emits a faint buzzing sound instead! I can confirm that the FTDI was running at 3.3v and I have used it for other 3.3v sensitive projects in the past. But obviously SOMETHING went wrong... Hobbyking support has thus far been useless... Can anybody help figure out went went wrong? I'm on my second OrangeRX LRS RX. The same thing happened to the first one. Is there anything I can do to recover these RXs? We're trying to fly with more than one OpenLRS in the air at the same time. Me and my buddy were a little hesitant because as soon as we turned the second transmitter on, both RSSIs went down from 100% to 40ish... both planes still on the ground. Any suggestions? We already separated the frequencies a bit but still have that drop in rssi when the second transmitter comes on. In case somebody else experiences this, I've found the solution. Using USBASP, I flashed both with a bootloader. I used Optiboot bootloader. After that, both worked with the configurator worked again. Note that the OrangeRX Rx boards can only take 3.3v on the programing pins so you need to power it via the channel pins with a 5v bec and NOT connect the vcc pin from the programmer. I am trying to program my Orange LRS UHF transmitter / RX setup. Using the arduino 1.6.8 software I have compiled for the Tx. I have a FTDI plugged into my PC usb port. I have selected the com port and the pro mini board. My question is what do i set the programmer to for the FTDI serial programmer? You don't, that's only needed to flash the bootloader to a blank chip. I get this error when I try and upload with programmer. I feel that I need to set it to something. Sketch uses 26,574 bytes (86%) of program storage space. Maximum is 30,720 bytes. Global variables use 1,427 bytes (69%) of dynamic memory, leaving 621 bytes for local variables. Maximum is 2,048 bytes. System wide configuration file is "I:\Program Files (x86)\Arduino\hardware\tools\avr/etc/avrdude.conf"
I used the Arduino program to load a boot loader with the usbasp. It seems to bind ok so now to put it in the air. I want to made a openlrs Hardware with si4463. I am having an issue with "Channel 1" not working on a "OrangeRx Open LRS 433MHz". No matter what pin I assign channel 1 too, I cannot get it to work. I am trying to flash my Orange Rx module. I've done it once before years ago. I am using the same programmer I used in the past. I tried several USB ports on two different computers, and two different USB cables. Each time I get the following results. I tried downloading an older version of the firmware, and I got the same results. What else can I try to get this working again? Here is a new Openlrsng module from Hobbyking. Plug&play for APM users. No more need of 3dr radios. did you know which kind of FW the receiver is using ? Does anyone know anything about the receiver in this set? I have found very little documentation for it and can't firgure out where to connect to it or what firmware to use. I recently got a HAWKEYE DELUXETX TARANIS JR TURNIGY COMPATIBLE transmitter (from here http://www.hobbiesfly.com/transmitter-r ... tible.html ) and a BROTRONICS 4CH REMIX receiver (from here http://www.hobbiesfly.com/transmitter-r ... eiver.html ). Right after unpacking I tried to connect both modules to the configurator, but although the configurator was able to open the serial port, it never received any answer from the modules. I tried all baud rates just to be sure, but still nothing. Then I reprogrammed both modules - I tried the latest stable and latest master versions - and still no response on the configurator. Have you had a problem like this before? It doesn't seem to be a hardware issue - if I program the modules with custom program, it runs as expected. I am hoping this forum is still somehow active, even thought there wasn't much activity recently. really don't understand what wrong, from log of apm i can see imput on end point so the controller pixfalcon read the imput good but the imput is not my command. The minimum time between PPM frames on the PPM output. The default value works fine for many systems but fickle systems such as Ardupilot require a longer sync time (ardupilot 3.1 and better works ok with 3000, some older versions apparently want 4200). "define Compile_TX 0" and "define BOARD_TYPE 2", everything else is left as is, CLI and CONFIGURATOR are also enabled. I was first trying the "BOARD_TYPE 3" for the RX module but couldn't get it to work at all. "define Compile_TX 1" and "define BOARD_TYPE 2", everything else is left as is, CLI and CONFIGURATOR are also enabled. With this setup I can get the 2 modules binded and have confirmed through Mission Control (USB connection to Pixhawk) that only 8ch signals I had set on my 9XR Pro are getting through (I have my radio to PPM and 13ch, default timings) , I have tried the Mavlink connection, by rerouting the signals (using the settings of EepeSky) to the bluetooth module I have installed in the Radio, as shown in other posts, but I don't get any data, probably cause I need to configure the modules. Is the "Phoenix Serial..." msg referring to the TX or the RX module. I have already made the Telemetry mode to the TX module and the 9XR Pro, but for the time of the connection to the configurator, I have disconnected the COM 2 cable that connects the TX modules RX & TX lines to the Radio, because It was messing the connection to the point I wasn't even getting the msg "14:00:19 -- Module - OpenLRSng TX starting". Is there anyone with pretty much the same setup that could shed some light to my problem? PS. This is not the set posted a few posts above, since I was not in need of the bluetooth feature of the set, otherwise it should be identical (the bluetooth module is probably just connected to the RX/TX lines inside the TX module). "OpenLRSng TX starting 3.7.3 on HW 2"
but can't do anything else, I tried sending blank and no response. if someone can send me a screenshot for the right way to do that ? Why not switch to sbus and get rid of a ton of latency? Hello. It's me again asking questions. So, My OrangeRX Open LRS 433MHz Transmitter 1W won't bind. Supprice supprice. I have two receivers that I have done my self and if I program another of them as a TX they bind, so I am quite certain they work. They are using 100mW Si4432, but to my knowledge Si4432 should be radio compatible with RFM22B/23B. Strange thing is that with the configurator's spectrum analyser I can see the bind signals with the OrangeRX module and my own modules, transmitted by the OrangeRX module, so it would seem that my OrangeRX transmits and receives signals, so the module should not be burned, right? I have used bunch of different antenna combinations, but I can't get the damned thing to bind. I have been using the latest OpenLRSng source from master branch. It shows version 3.9. Compiled and flashed all from the same source, of course. Using board type 2 for the OrangeRX modules and my own board type for my own RX modules. I have only made changes to the hardware.h and the main .ino file, to add my board, so these changes should not affect the OrangeRX module code. I have taken the liberty to add some screen captures of the spectrum analyser graphs, in the hope that someone with more experience could take a look at them. I have no clue if the background noise and the signal level are amazing, horrible or something between. I have a USB-SDR (One of those TV-stick thingies!) that I could use as a spectrum analyser, if needed. I would appreciate any help. The module is purchased from Hobby King and it should have some sort of warranty, but I have heard that RMA:s with them are sometimes real PITA, so I rather try to figure this out if possible. About the different antennas used in tests. Black OEM = original pig from OrangeRX module, with cheap 433mhz from candy rock mountain. OEM = Small helical antenna that came with the Si4432 modules, soldered to pig from candy rock mountain. DIY dipole = DIY dipole antenna using original pig from OrangeRX module. Edit: I forgot to add. My DIY modules bind with all antenna/pig combinations.